This week’s five AHAs are from the AHAbook™ The 24-Hour Turnaround. Please share this URL “aha.pub/24Turnaround” in your social media status update to let your friends know about it. “The 24-Hour Turnaround” is a second-edition book created by authors Jeffrey S. Davis and Mark Cohen. This book provides a blueprint for entrepreneurs and highlights efficient entrepreneurial styles, innovations, and strategies that other business leaders can use in their goal towards achieving overall and continuous success. This successful book is available on Amazon in hardcover, paperback, and Kindle versions: https://amazon.com/24-Hour-Turnaround-2nd-Amazing-Entrepreneurs/dp/1600052746. In addition, the two authors also released a companion book entitled “Jeffrey S. Davis and Mark Cohen on The 24-Hour Turnaround.” This book contains 140 AHAmessages in a Twitter-sized format and serves as an inspirational and practical guide for business leaders or entrepreneurs who dream of achieving a successful business amidst the challenges of an uncertain economic market. The book is also available on Amazon in hardcover, paperback, and Kindle versions: https://www.amazon.com/Jeffrey-Davis-Cohen-24-Hour-Turnaround/dp/1616992069/. 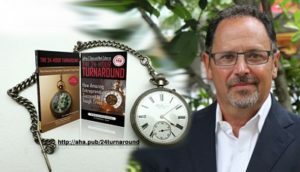 You can also register or use AHAthat as a guest to learn more about “Jeffrey S. Davis and Mark Cohen on The 24-Hour Turnaround” and start sharing AHAmessages with a click of a mouse at http://aha.pub/24turnaround. To see and learn how to automatically share AHAmessages from this book, you may check out this video: https://youtu.be/HcJRanRTO0M. To know how to automatically share via AHAblaster, please watch https://youtu.be/ZrrSq-4CeGY.